Ladies and gentlemen (and kids, too) will be happy to get their hands on this Strawberry-Kiwi Ladyfinger Dessert! Crush 12 ladyfingers; mix with butter. Press on bottom of 9-inch springform pan sprayed with cooking spray. Cut remaining ladyfingers crosswise in half; stand, cut sides down and rounded sides out, around rim of pan. Add boiling water to dry jelly powder in large bowl; stir 2 min. until completely dissolved. Add ice; stir until melted. Beat cream cheese and sugar in large bowl with mixer until blended. Gradually beat in jelly. Whisk in Cool Whip; pour into prepared pan. Refrigerate 4 hours or until firm. 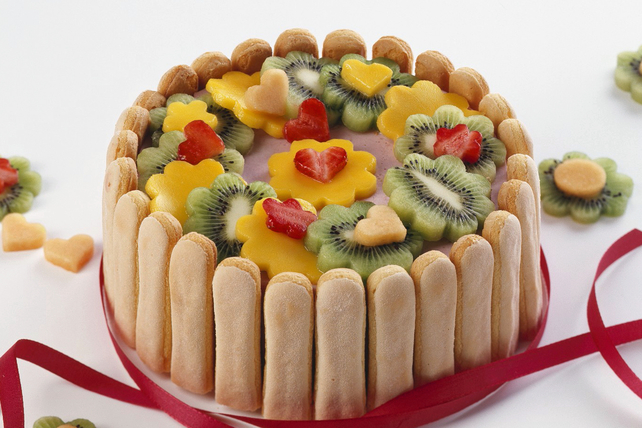 Peel, then slice mango and kiwi; cut into shapes with flower-shaped cookie cutter. Slice strawberries; cut into shapes with small heart-shaped cookie cutter. Garnish dessert with fruit cutouts just before serving. Balance out your food choices throughout the day so you can enjoy a serving of this delicious dessert.